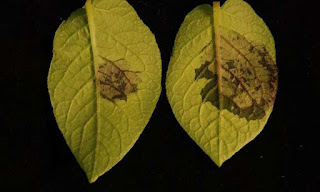 Plants can sense parasitic roundworms in the soil by picking up on their chemical signals, a team of researchers at the Boyce Thompson Institute for Plant Research (BTI), on the Cornell University campus, has found. nematodes, but also against bacterial, fungal and viral infection. may yield a nontoxic agricultural treatment against nematodes and other pests. "It's a very significant discovery that plants can perceive chemical signals from an animal – our work provides some of the first evidence for this," said BTI professor Daniel Klessig. manner." Plants can "see" light and "hear" the vibrations from chewing caterpillars, but now BTI scientists have found that they can "smell" the essence of parasitic nematodes. By monitoring the worms' chemical signals, plants can sense whether they soon will be under attack. species, showing that ascarosides represent an evolutionarily ancient means of chemical communication. million years," said BTI professor Frank C. Schroeder. and in association with plants and animals. While many nematode species are harmless, plant-parasitic nematodes cause an estimated $100 billion in agricultural damage worldwide each year. There are few effective treatments, and regulatory agencies in Europe and the U.S. are phasing out some previously approved pesticides because of toxicity or environmental concerns. simply spraying plant leaves with ascr#18 solution. "We show that plants have learned to perceive nematodes, and in response to that, they get stronger. They turn on pathways that help them fend off disease," said Schroeder. "Therefore, the use of ascr#18 may have great potential in agricultural applications for broad-spectrum protection." activation of the immune system.